Very nice picture. I Can't wait anymore ! 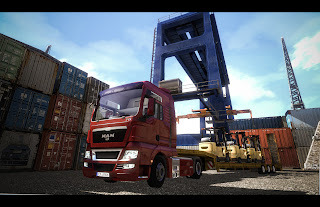 I think it would be cool if we could pick loads up from the docks (containers) and do multidrop deliveries, 2 or 3 maybe before reload. Good job scs. these trucks looks great :) The graphic is amazing :) !! You can see TWO shadows, 1st under the whole truck (darker) and 2nd at the side of the truck (lighter). Do you see what I mean? You are lack of a shadow under the track! This look so unrealistic, please add the 1st shadow! In previous games you had this shadow. I'm not malicious I just want to help you to make this game better. interesting, what about optimization..? Job wonderful, realy. But that would be on the computers 2004 - 2005 period? Thanks for the update! The images aren't revealing anything indeed, nevertheless they look fabulous! Oh my God... Thats awesome !! amazing!!! There is the original sing of mercedes on picture 4!! and the licens plate is changing. Very good! The trucks are perfect, and the chart is also good. I have three suggestions that you could put in the game, these three will not weigh heavily in the game, and will be optional (in case + Esc Options). First, add the filling of the 'bar' (pressure brake) when you turn the truck, wait 30 seconds to 1 minute there after the truck floor. Second. The tires, giving the effect that a tire is getting old, and bad to walk with him. Of up to buy a tire in post, at the dealership. And third, in a case of a 6x2 truck, power lift the third axis, when out of power. Well that's it, if you can at least make only one I quoted above, blog we will be happy ! 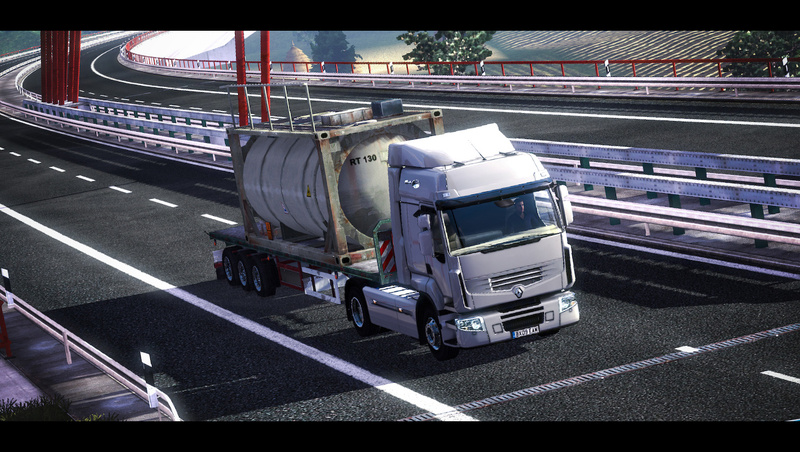 good job SCS.Renault Premium is very very very nice.Keep up the good work. Thank you for the extra screenshots, and thank you for keeping us up-to-date, despite your budy schedule. The world needs more developers like you. All I can say is: OMFG! Absolutely amazing SCS, as always! The detail on the trucks and the map itself is by far greater than any game before! Just a suggestion - the marker lights on the truck should light up (on the visor, for example). Also, it would be great if we could have more control over the lights (besides off/lo/hi beam, maybe add the possibility to have only parking lights illuminated). while watching the screenshots (and playing a first game) i couldn't help myself but to notice how squeaky clean and reflective the trucks were. some matte colors and/or dirt on truck over a certain period of time would greatly improve realism. i remember few years back ago that there was some hype about a game or movie that used dirty and battered spaceships textures and it was praised greatly by critics. whatever your game may look or feel like i'm sure to buy it first day its out and i hope you will have fun making it as i will have fun playing it. hellooooooooooo we want to play online plz ._. 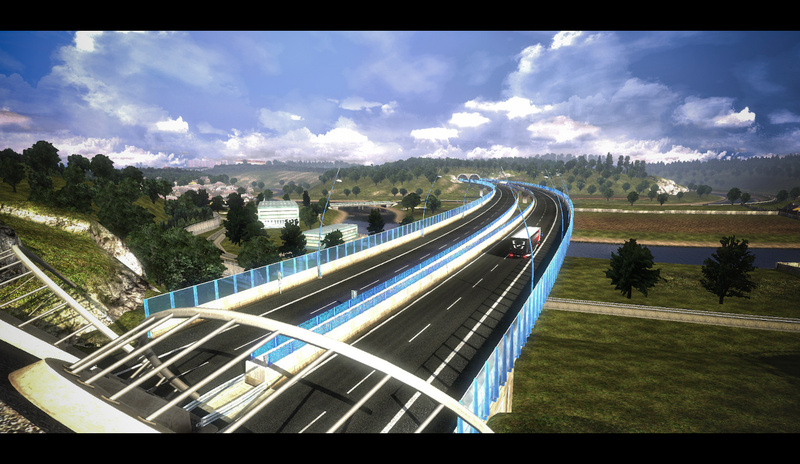 Splendid work SCS Software team. Can't wait till release. Very nice screenshots and there is a big variety of trailer, that's good. It would be nice if there was the possibility to transfer trains or wagons from certain destinations, it needs a huge trailer but it would be a good challenge to test how good we drive!! excelent work SCS keep going!!!! 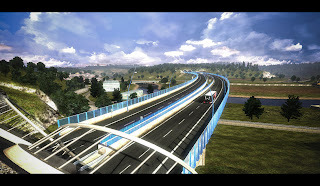 And I have a question, after the ETS2 you already have something in mind to continue?? As the Bus Driver, 18 Wheels of Steel or something different? Great job SCSSoft! And yes, i'm very happy with the screens ;) I can't wait until the releasedate. 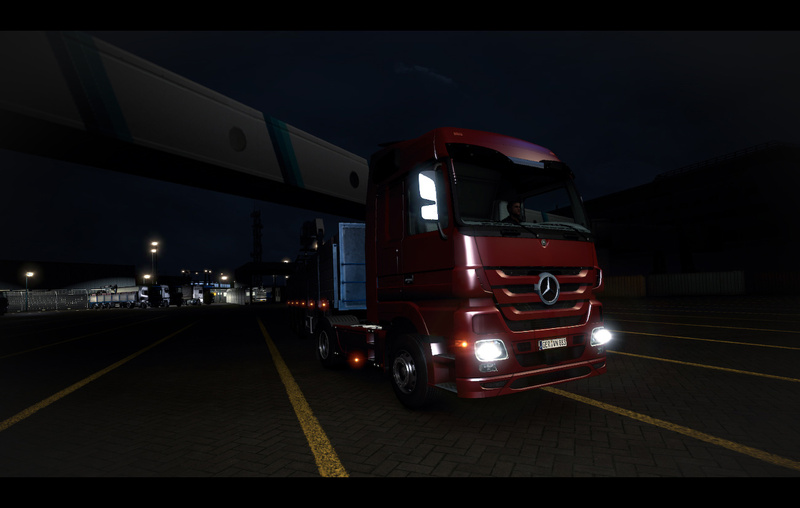 Thanks SCS Software team for all your hard work, it`s looking fantastic. Those pictures were so good, I thought they were real at first. Very good job, I love it. The trucks have realistic shine to them, and the scenery is much more exciting than before. If you can't post often, don't try to. Keep working on your game. Nice pictures. And nice job SCS. But I wanna put you a question: Will be snow in ETS2???? PLEASE SHOW AS A VIDEO WITH WEATHER!!!! Beyonds photos, I wonder what about the fuel consumption of the trucks? will there be any difference between loaded(full) truck and empty truck? Please creat a multiplayer!!!!!!! !The game becomes more fun with multiplayer!!!!!!!!!! Beautiful images. I think remain a few details to be reviewed. The game should even be almost ready. Great job you did. So I admire much this company. The wish-list is big. The Fans have a lot of stuff, that would be fixed in Eurotrucksimulator2. And what I like, is that SCS hear our calls, thats more than fantastic. Good job SCS!! You are the number 1 in the world by making simulation games! P.s: That MAN looks great!! superbe bouleau vraiment je suis trop presser de connaitre la date de sorties !!!!!!!!!!!!!!!!!!!! merci a vous les gars vos simulateur sont trop bien!!!!!!!!!! very nice pictures, thumb up!